AnDAL is subtly introducing the doctrine of Karmic Imprints in these wonderful lines-The Embodiment of the jiva is the result of subjection to karmic imprints that are carried over innumerable births in the past into the Present and carried forward into countless Future births-The wheel of Births and Deaths goes round and round until the momentum of Karmic load is lightened and finally disassociated and Dissolved. The Very reason for an offspring to come into being in any family is to share a part of the imprint-burden of their parents.These imprints are garnered by each embodied soul(jiva)through his or her desires and deeds.The Life-energy is our soul otherwise known as 'spirit';and to learn about it is 'spiritual Knowledge'.The life-energy is only an agglomeration of ethereal particles filling the entire space of the universe and pure in its Native State.In Humans,it is under pressure like compressed air within the cycle-tube.Mind is only a projection of the life-energy;and it is the mind in the state of ignorance of its own origin and intoxication with sense-pleasures that hooks on to worldly persons and objects,gets into emotional moods and reaps the consequences of its deeds that are deposited as imprints on the soul. Every Object has an inherent quality.A Quality could also be induced in it.Take Water for example.coolness inheres in it.you can pour it into a vessel and heat that container.What is the Result?it has become Hot water,the quality of Heat has been introduced into it.The heating of water calls for effort;but not the cooling thereafter.Take the vessel off the burner and leave it alone;the water automatically loses its heat and return to ambient temperature. Likewise with the Life-energy.Imprints are foreign to it and so it seeks to throw them off.This can be done only through the Physical Body which is the container.Why so?The Imprints were acquired in the first instance by the soul only through the medium of the physical body. All through a person's life the soul is engaged only in purging itself of the imprints;and this accounts for our pain-and-pleasure experiences.when the soul realises that a person would not be able to clear his or her burden in the remaining life-span,it has to bring in a working partner in the form of son or daughter.This is the basis for the urge for marriage and the subsequent pressure to bring forth progeny.Part of the parents' load is passed on to the next generation which,in turn,does whatever the parents did and harvests the same consequences. One's arrival on this planet as the son or daughter in a particular family was not an accident.The Life-energy assembled for itself a physical body utilising which it projected as the mind in order to purge itself of the dross of imprints accumulated through countless births.The Obstacles to this endeavour are the negative imprints inherited as well as those added during the course of living in the years of spiritual ignorance.This burden differs in quantity and quality from person to person and hence the variation in the extent of progress registered by them at any given moment. The Karmic imprints should be identified and those that are disadvantageous to the journey of the soul weeded out through diligent practice.The imprints surface in the mind as thoughts;whenever a thought arises,it should be evaluated before being translated into action. 'Will my acting on this thought subserve the purpose of life or will it entrench me deeper in the quagmire I am already in? '-This is the question to which we have to find an answer each time ,on our own responsibility.If we assess that the implementation of a particular thought could cause harm or hurt to us or any other living being,either at present or at a later date,one should determine to abandon the thought.The Possible consequences one has tabulated should be consolidated into a new thought in order to counter the old one(Pratipaksha bhavana).This might have to be done day after day,until the original thought becomes attenuated and ultimately non-existent.The practice may sound assiduous but actually it is not so.It is less difficult than kicking the starter of the motorcycle in order to spur the engine into action.Lifting the mind out of the rut;once that is put in,the mind would run on its own motive power.This is why the Trained mind is one's best Guru. Having understood this,all we have to do is to be in a state of awareness so that the purpose of embodiment of the soul be fulfilled without any let or hindrance. Rough-hew them how we will"
We need to be conscious of the Divinity in which we live and move and have our being;and do nothing to disturb the rhythm of Nature.Life then would be a pleasant hike and the Goal will come within our ken. If we inherit the karmic imprints ,do we help our parents and forefathers to clear their karmic load and free them from the chain of transmigration?The answer to this is an emphatic yes.It depends on whether we work towards the clearing of the 'dues' or add to it.If we add to the load of imprints we not only have to suffer the consequences but will end up adding to the burden and passing it onto our offsprings who in turn have to suffer the consequences.This puts us under a two fold responsibility-to serve our parents and forefathers free themselves of the imprints,and also to ensure that we do not pass on adverse imprints to our children but only hand over assets that they in turn inherit and turn it into purposeful living serving the Totality of Nature. by making him foremost(jnAni)in a Gathering. TGN points to the key word நன்றி-Gratitude;A Father is indebted to his son(or daughter)because the son has to carry a share of the load of imprints;he therefore has the Responsibility to guide the son to become a JnAni. in giving birth to a Noble child. is garnered by their deeds. 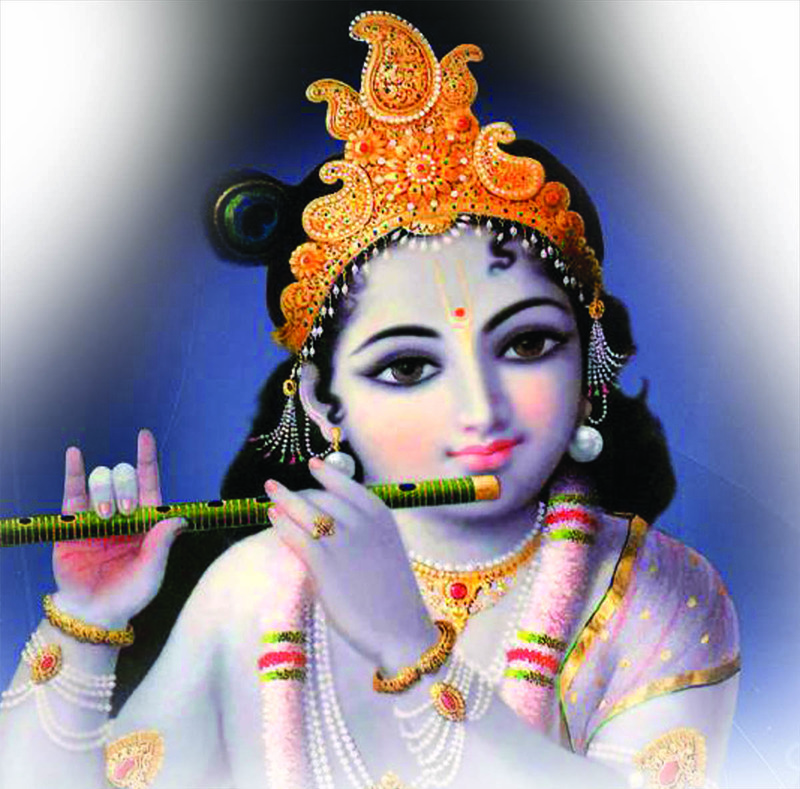 it is to hear that he is a JnAni. TGN points out that even a poor mother who already has several children is filled with Happiness and a sense of fulfillment when she gives birth to a new Baby;this is an unconscious lightening of the Karmic load that is transferred to the infant.Yet,Greater and permanent is the sense of fulfillment of such a mother when her child grows up and attains the purpose of living in attaining jnAna. is to Elicit the word -'What penance the Father did to beget such a son'! தாயைக் குடல் விளக்கம் :By virtue of having given Birth to the Lord,the mother is purged of her karmic imprints. தாமோதரனைத்:Lord Sri Krishna allowed himself to be tied by a thick cord by Mother Yashoda.This shows his accessibility.The Lord is bound by the cord of Love. Be it Krishna, Adi Sankara or Ramakrishna,Chaitanya or Ramana-They were bound by the Love of Mother. Flowers are symbolic of freshness and purity-Like this,our thoughts of devotion are pure and Fresh and not just an act of Routine ritual.Our act of worship should be an expression of this Devotion. This may be either in our words or the wonderful compositions of The Great ones-The Key thing is that it should come from deep within us.This keeps the mind in Steady contemplation. Our Lady AnDAL is giving a wonderful and simple method that is accessible to one and all-It is to harmonize our act,words and thoughts in the act of worshipping the Divine whose very Nature is Love. This is AnDAL's assurance to the earnest seeker. Sri Ravi, you have rekindled my spirits to revisit Srimad Bhagavatam once again, thank you. Thank you for resuming Tiruppavai commentary. வெள்ளை விளி சங்கின் பேரரவம் கேட்டிலையோ? is sounding in strength,don't you hear? on the serpent-couch in the ocean of milk. to enter our minds and impart serenity. Thank you very much for giving beautiful inner meaning of Thruppavai. One line gives the essence of advaitham and atma vicharam. Andal's poem is equalvant to THRUKKURAL. As avvaiyar says, KADUKAI THULAITHU EZH KADALI PUGATTI KURUGATH THARITHA KURAL. புள்ளரையன் கோயிலில் puLLaraiyan kOyilil;புள் puLL =bird,அரையன் =அரசன் =King ;புள்ளரையன்=King of Birds,and refers to Garuda,The Eagle vehicle of the Lord. (who himself is the king of birds) the calling conch so white in hue is sounding in strength,don't you hear? பிள்ளாய் எழுந்திராய் piLLAi ezhunthirAi O Child!Wake up! பேய் முலை நஞ்சுண்டு pEymulai nanjundu-He who suckled away the venom contained in the deceit-laden breast of the demoness putanai-The Lord sucked not just the poison but her entire karmic baggage as well and Granted her Moksha. Here AnDAL is again referring to the Baby Days of Lord Sri Krishna when he killed the Demon shakatAsura with a single kick from his baby foot!The Demon ShakatAsura who was in disguise as the wheel of a cart-The Wheel with 6 spokes represents Kama,Krodha,Moha,Lobha,Mada and Mascharya with 'Ego sense' as its axle.This wheel is the wheel of Samsara that takes the ensnared jiva into the forest of samsara and perpetuates the Birth-death-Birth sequences. வெள்ளத்தரவில் துயிலமர்ந்த வித்தினை =He is the seed of seeds reclined in wakeful slumber on the serpent-couch in the ocean of milk. This is one of the most wonderful and powerful symbolism-Of all creatures it is only the snake that can coil itself so much so that one cannot notice where the Head and tail is-This is why it is called Adi Sesha;Adi Refers to the Primeval Beginning and Sesha refers to that which remains at the end of everything-The Adi is the Sesha -The Alpha and Omega of all things and the Lord is as if Reposing on the Adi Sesha ,in the ocean of pure Awareness (வெள்ளம்). Tiruppavai. Then I found out puL = bird; araiyan = Raja = Rayar = King. King of birds Garuda! வியப்பிது காண்! பள்ளி யெழுந்தரு ளாயே! அள்ளிய தெள்ளமு தன்னை எம் அன்னை! Such a treasure, beautiful interpretations on Tiruppavai and many other things (Adi Sesha - beginning and remaining? never knew that) We all will have a new appreciation of Tiruppavai.. even special because our Bharathi was also inspired by it. Is this speech available as recording? மெள்ள எழுந்து meLLa ezhundhu awaken gently -Here the reference is to the Yogis and Sages-as they awaken from their sleep which is akin to yoganidra-This is bound to be 'gentle' only and what is experienced in the Deep sleep state is continued to be experienced in their waking state as well;the awareness is ever present and in their cases,there is no rise of the 'Ego' as in the case of the Ignorant souls that brings about an abrupt shift in the consciousness and giving rise to the concommitant world process. as the Yogis and Munis are calling the Lord as 'HariH' ,holding him in their Heart,the loud volume is reaching out everywhere and it enters the Heart of all those awake! உள்ளம் புகுந்து குளிர்ந்தேலோர் எம்பாவாய்! uLLam pughundhu kuLirndhu el Or empAvAi enter our minds and impart serenity -Listen and ponder,our girl! உள்ளம் புகுந்து குளிர்ந்து =Seep into the listener's Heart and cools it in serenity. AnDAL begins the verse with புள்ளும் சிலம்பின காண் and ends with வித்தினை உள்ளத்துக் கொண்டு முனிவர்களும் யோகிகளும் மெள்ள எழுந்து அரி என்ற பேரரவம் -Meaning that the entire creation is bustling with praise of the Lord !Even the Perfect ones chant the Name in sheer ecstasy,not that they are doing any sadhana thereby.Yet it helps the other seekers to tune themselves. Screeching and making converse among themselves? to the jingling of jewel-pieces in their neck-chains? Known too as kesavan?You with a dazzling personality. Do open the door.Listen and ponder ,our girl !